Hello Friends! Tick tock, tick tock! Do you hear that sound? It’s the minutes until Christmas “goes live.” I created these sweet Graphic 45 Twelve Days of Christmas Treat Tags to share with you today. I think I can just slip these beauties in under the wire for the #G45Tag Challenge this month. Last week, I shared some cutie patootie Christmas Magic Tags with you. So I thought I would give equal time to the elegant styling of The Twelve Days of Christmas with these tags. Once again, I’ve used G45 Alpha Banner Tags for my base. These are the Kraft Alpha Banner Tags. 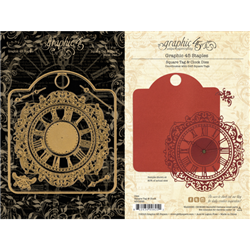 The Graphic 45 Staples Regular Tag and Gears Die makes short work of creating these pretty tags. Just die cut the base layer, add a border strip from the collection, a small doily, Tag and Pocket, chipboard or sticker and a ribbon adorned mini candy cane. Easy Peasy! I think these would make great stocking stuffers. Or great place cards at your holiday table! Tags are a great way to use up scraps. You could even hang these on the tree. So that’s all for me today! I just thought you’d like to see these and maybe find inspiration for your own last minute crafting. Thanks so much for stopping by! I’m off to bake some cookies! This entry was posted in Graphic 45, Tags, Twelve Days of Christmas and tagged Christmas, Graphic 45, tags, Twelve Days of Christmas on December 17, 2018 by kathycNC. Hello, Friends! Happy Friday! Let the Christmas countdown begin. I’m just popping in with a last minute Christmas Magic Gift Card Tags Tutorial today. It seems that everyone wants gift cards for Christmas these days, so I feel that we should at least make the packaging feel like a gift! This set of 8 tags can be made very quickly using Graphic 45’s Christmas Magic Collection. They can also double as ornaments on the tree, which is extra fun. Do any of you have any of the Graphic 45 Alpha Tags in your stash? That’s what I used as the base for these adorable tags. If you don’t have those, you can use any of the Graphic 45 Regular Tags and ATC tags instead. The front of each tag contains a little “book” that is tied shut with ribbon. On the inside you’ll find the “B” side of a Christmas Magic ephemera card and a little gift card pocket. To maket he tags feel even more festive, I’ve tucked in a Brach’s miniature candy cane. I put together this easy to follow Christmas Magic Gift Card Tags Tutorial on my YouTube Channel. I hope you enjoy! The great thing about this design is, you can change up the papers and make these for any occasion! How great is that? And if you’d like to see another G45 gift tag idea from the archives, check HERE. I hope I shared some tips, techniques and ideas that you can use in your own crafty adventures. If so I’d love to hear from you in the comment section below. This entry was posted in Christmas, Christmas Magic, Graphic 45, Tags, Tutorials, Videos and tagged Christmas, Christmas Magic, Graphic 45, tags, tutorials, Videos on December 14, 2018 by kathycNC. Hello, Friends! I’m sneaking just in under the wire to share a Christmas in July post using fabulous retro Christmas papers from Authentique Jingle! We have a lot of ground to cover with project ideas, tutorials and even a video. So grab a cuppa and a snack and we’ll get started! It’s always a good idea to get a jump start on holiday projects. I’m hoping you’ll be inspired to get to work on your Christmas list as I share a new fancy fold card, a quick and easy flip folio and a trio of Christmas Gift Card Tag Ornaments with you today. Cards that can double as gifts are awesome. But cards that can be a card, a gift, and home decor…well those are fabulous, right? This fun Easel Step Card design falls into that category. I’ve seen these all over the internet lately. This design is slightly modified so that I could make one of my standard 7″ x 5″ cards. I have wonderful 12″ x 17″ kraft cardstock from Envelopes.com in my stash so there was no need to join papers together. (Please note: you can find all the product links in the supply list at the end of this post.) If you don’t happen to have this oversized cardstock in your stash, you can just join two 8.5″ x 11″ sheets of kraft cardstock with 1/2″ Scor-Tape, then cut, score and fold. Here’s a side view of this fun to make card. It comes together so quickly that you will want to make loads of them! TIP: Keep the embellishments on this card on the simple side. You want it to be able to fold. Trim to measure 7″ x 17″. Then, cut two 6 7/8″ x 2″ panels of complementary designer paper. Finally, cut two 6 7/8″ x 1 1/8 panels of complementary designer paper. Now punch out the “You Better Not Pout” oval, the “Ho, Ho, Ho” border and the “Santa’s Almost Here” border from the 12″ x 12 Component Sheet. TIP: For easy mailing, leave off the bow, jingle bells and flowers. Inside, I created a pocket from the “Dear Santa” component. Then I die cut one of Eileen Hull’s Credit Card Sleeves and Tag Dies to serve as a gift card holder. The cute little tag on the bottom is also cut with this die. TIP: Mat the credit card sleeve die cut on kraft paper for extra stability. Be careful to add just a very thin bead of adhesive, or you won’t be able to fit the gift card in the sleeve. Then, fold and burnish to create a vertical wallet with two 1/4″ spines and a tab closure. Next, trim the short panel to measure 3 3/4″ x 2 1/4″. Now, cut 2 peppermint stripe panels to measure 3 3/4″ x 2 1/4″. These will line the tab closure. Next, cut 4 Jingle panels to measure 3 3/4″ x 6 1/2″. These will line the front and back covers, and the interior. I used Jingle One, Jingle Six, Jingle Two and Jingle Six. The focal image on the cover is made with one of the component sheet punch out images. Cut out the image about 1/8″ wider than your traced lines. Erase the lines. Here’s a peek at the top tab. The inside of this mini waterfall folio is very, very simple. You can’t add a ton of embellishments or layers because the cover won’t close. To stretch my designer paper, I used Authentique Spectrum Cardstock (Robin’s Egg Two, Red Licorice One) to create flaps, pockets and the waterfall. Cut the Spectrum Cardstock to measure 3 1/2″ x 4 1/2″. I used a Corner Chomper Stub Punch to shape the corners. Then score a 1/2″ flap on the top of each panel and adhere them to the base. Cut an 8 1/2″ x 1″ strip of Jingle Six to serve as a belly band. To do this, I wrapped the belly band around the waterfall and folded. Here you can see how I attached the belly band. I also used scraps to create a little pocket filled with teeny tiny tags and an itty bitty folio. Authentique Jingle is such an inspiring collection to work with. I just kept getting one idea right after another. Since so many of us give gift cards at Christmas, I knew I wanted to create some sort of super cute gift card holder. Then I thought about handmade ornaments for the tree. And what about gift tags? So I kind of threw all these ideas into the hat and came up with these festive Gift Card Ornament Tags. So, so fun (and easy) to make! Since I created a video tutorial for these tags, I won’t go into a lot of detail here. I’ll just show you the cute pictures with a quick comment. Each tag has a ribbon/button hanger on the top. I could see these hung on a tree, or strung on a banner or stocking hangers. That way , they are also home decor. The reverse side of each tag has a cute little gift card holder. These are made with Eileen Hull’s Credit Card Sleeves and Tags Dies from Sizzix. I die cut numbers from a retired My Favorite Things die set. This tag has a cute magnetic folio attached to the back. There’s the gift card holder and room to write a note and/or add a photo. This is the tag we will make together in the video tutorial. I’ve used the G45 Square Tag and Clock Dies on all these tags. The back side has another cute magnetic folio. With the gift card holder tucked inside. So are you ready to get your craft on? This video has a short overview of each project with tips and tricks to help you re-create them. Then there’s a full tutorial for the final tag. Enjoy! Thanks so much for hanging with me! I know this was a long post! But I really wanted to share measurements, tips and instructions with you. You’ll find the linked supply list below. All projects use the Authentique Jingle 12×12 Collection Kit and 12×12 Components (comes with collection kit) If you make all 3 projects, you may need more than one collection kit. I’ve organized the supply list by project for your convenience. Please Note: I link to products whenever possible. However, some items have been in my stash a long time and I no longer know where they came from. Other items may be retired. Find substitutes in your stash. This entry was posted in Authentique, Cards with Special Folds, Christmas, Chrstmas Decorations, Folios, Jingle, Tags, Tutorials, Videos and tagged Authentique, Cards with Special folds, Christmas, Folios, Jingle, tags, tutorials, Videos on July 30, 2018 by kathycNC.